Morphological studies of modern lamnids by systematist Leonard J.V. Compagno and others provide another source of evidence useful for tracing the group's evolutionary history. Such studies not only support that Isurus derived from Carcharodon, but also suggest that Carcharodon derived from Lamna. Intriguing new evidence from molecular genetics fully supports this evolutionary hypothesis. It is not yet clear from the fossil record which lamnoid was the common ancestor of Lamna, Carcharodon, and Isurus. Some paleontological circles suspect the best candidate may be Isurolamna inflata or a similar as-yet undiscovered species. Other circles favor a species called Cretolamna appendiculata, known from fossil teeth dating from the late Cretaceous to the mid-Paleocene (about 100 to 60 million years ago). 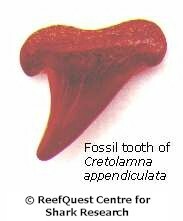 The teeth of Cretolamna are much more solidly built than those of any modern lamnid. But Cretolamna teeth resemble those of Lamna in being smooth-edged with well-developed basal cusplets (small secondary cusps on either side of the main blade). In addition to being a possible ancestor of the mighty great white, Cretolamna almost certainly gave rise to one of the most fearsome predators the ocean has ever produced, the giant-toothed shark known as Megalodon.